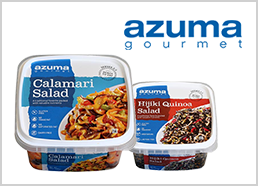 Results for "Veggie Friendly" | Azuma Foods International Inc., U.S.A. Turn your ordinary pasta into a healthy and unique plate by just mixing our Hijiki Salad with Quinoa. Already fully cooked Yasai Kakiage is a very flavorful Veggie recipe. Great for Vegetarian burger. Yasai Kakiage is not only for Japanese dish. It is a deep fried vegetable with batter which is great for any dish. Stir fry boiled pasta, olive oil, Seaweed Salad Delight, salt & pepper. Garnish with bright colored greens. Just drizzle over sesame dressing. Age Tofu comes pre-cooked and ready to eat, toss it on any Vegetarian dish to add protein and flavor. Just mix our Age Tofu and Edamame Salad with wild rice together. It will become a perfect veggie meal that pleasures your stomach. Toss Age Tofu and poke sauce together, arrange Edamame and Seaweed Salad Delight. Top it off with our Umami Toppers. Veggie Poke topped with Edamame and Umami Toppers for more wholesome flavor. Toss Age Tofu and Seaweed Salad Delight with Vegetarian Mayo & Sriracha. Serve together with Seaweed Salad Ginger and Edamame. Toss Age Tofu, Edamame Salad, and mixed greens. Drizzle over creamy dressing for a very savory salad dish. Simply lay Hijiki Salad on top of rice. Cold wild rice would make a great salad like bowl. Simply top our Hijiki Salads with Quinoa on top of mixed greens for a satisfying salad. Sliced fresh mozzarella, topped with our Hijiki Salad with Quinoa and diced tomatoes. Cut Yasai Kakiage into a small portion, and make nigiri. A very rare vegetarian sushi. Put Yasai Kakiage on top of vegetarian coleslaw. It will become a very easy to serve Tartare. Just lay on top of a bowl of rice, and it is ready to serve. A Yasai Kakiage donburi, a great side for ramen.